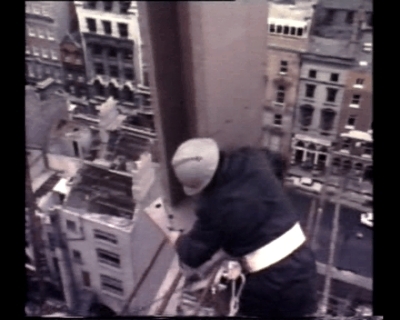 Dublin's Central Bank building on Dame St., was designed by architect Sam Stephenson in the Seventies. 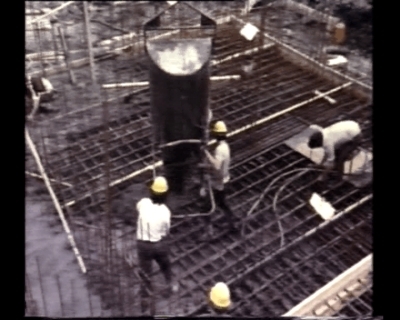 The engineering firm John Sisk & Sons, who carried out the construction, commissioned IFMA Ltd. to make an industrial film documenting the innovative modern construction techniques involved. 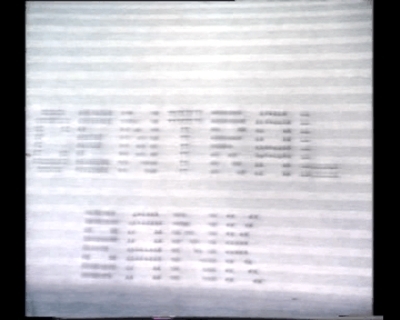 The result was a 16mm film called The Big Bank. I came across a reference to a screening of this film in a newspaper clipping in the Stephenson file in the Irish Architectural Archives. After a long process of trying to locate it, I acquired an mpeg on a cd. As the name would suggest, The Big Bank(re-edit) is a re-edited version of this film. 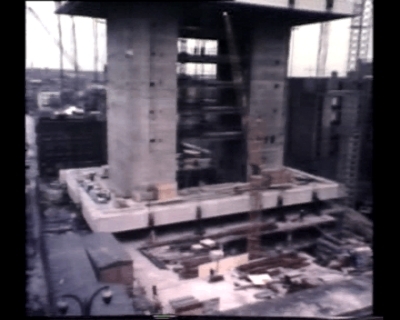 I removed the audio from the centre third of the film which trumpets the facts and figures of the engineering achievements involved and re-edited the footage to focus on the workers involved in implementing the new construction methods. The Big Bank(re-edit) was produced as my contribution to The Visual Culture of Modernity in Ireland, a workshop at the National Library of Ireland on September 25th 2009. It was screened at the Irish Film Institute in May 2011, as part of the Dublin: Sean agus Nua, a screening programme curated by Sunniva O'Flynn (IFI) and Lisa Godson (GradCAM/NCAD).